What is a local Transaction and Use (Sales) Tax? A Transaction and Use Tax, also referred to as Sales Tax, is a tax on the sale of merchandise and other tangible personal property, including vehicles. 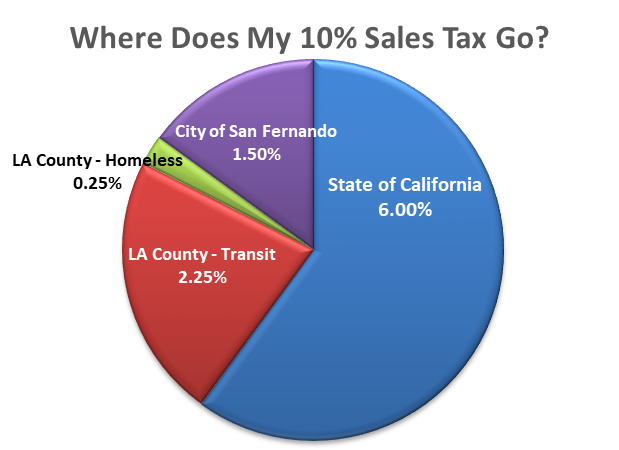 In Los Angeles County, the base Sales Tax is 9.5%, of which the City receives 1.0%. The remaining 8.5% goes to fund the State and County. The increased Sales Tax rate went into effect on October 1, 2013 and expires on October 1, 2020. How have the additional local Sales Tax funds (Measure A) been used? Revenues raised through the local Sales Tax have been critical to cover the short-term operating budget deficit, pay down debt, establish reserves, and fund key projects. Decrease the General Fund deficit from ($5.7 million) in 2014 to less than ($500,000) by the end of 2018. Improve public safety reliability and response time by replacing ten (10) police patrol vehicles and upgrading all in-car computers. Resurface 5+ miles of streets including: Alexander Street, Huntington Street, Library Street, San Fernando Road, and the upcoming reconstruction of Glenoaks Boulevard. Beautify Brand Boulevard to create a notable entrance into the City. Replace and repair more than 43,000 square feet of sidewalks and install 77 ADA compliant curb ramps with truncated domes. Construct “Safe Routes to School” measures to increase safety for children walking and biking to school. Support a number of special events, including Dia de los Muertos 5k run, San Fernando Open Streets Festival, and JAM sessions. Upgrade the tot lot and gymnasium at Recreation Park and facility improvements at Las Palmas Park, Pioneer Park and Layne Park. Create an award winning website and significantly increased social media presence to better inform the community. Replace the City’s outdated network equipment and software to protect customer information and increase efficiency. How will local Sales Tax funds be used if the tax is extended? Attract unique and top notch entertainment, retail, and restaurants. Revitalize downtown with a movie theater, new restaurants, expanded entertainment and a parking structure. Increase the number of Police Officers patrolling the streets (the number of sworn Police Officers has been reduced from 38 to 31 since 2008). Increase field staff to keep the City clean (the number of Public Works employees has been reduced from 47 to 34 since 2008). Enhance the annual residential street paving program to pave or resurface every street in San Fernando on a 10-year cycle. Implement a sidewalk repair and replacement program. Repair, replace and maintain the City’s playground and exercise equipment, tot lots, sports fields, and park lighting. Upgrade house, bathrooms and fields at Pioneer Park. Upgrade fields at Recreation Park. Enhance cultural programming and special events. Continue San Fernando Open Streets event. Enhance the Dia de los Muertos 5K Relay Run. Increase Summer Concerts and Movies. Re-establish 4th of July Fireworks Show. Establish a “rainy day” fund to weather financial downturns and protect the General Fund from the impact of large unexpected costs. What will happen if the local Sales Tax is not extended? If the local Sales Tax is not extended, there will be a significant decrease in revenue just as the City is starting to build a solid financial base. Unless a comparable new revenue source is identified, the City will be living “paycheck-to-paycheck” and be financially vulnerable to slight economic downturns, adverse lawsuits, and long term pension liabilities. Based on current estimates, the City will also be unable to pave streets, repair recreation facilities, or replace safety vehicles and equipment with any regularity unless a new revenue source is identified. How much additional revenue has the existing local Sales Tax (Measure A) generated? Through June, 2018, the local Sales Tax has generated $10.6 million in revenue and is projected to generate an additional $5 million before the Tax sunsets in October 2020. The Tax has been critical to saving the City from bankruptcy, reducing the City’s deficit and paying down debt, replacing public safety equipment, and completing street resurfacing and park rehabilitation projects. Measure A accounts for more than 12% of total General Fund revenue each year. Since 2005, the City’s financial position has changed significantly. The General Fund, which pays for police, fire, recreation and public works services, experienced a dramatic decrease in the amount of money available to provide services. The City’s reserves fell from $7.1 million in 2006 to a negative ($5.7 million) in 2014. The dramatic reduction was the result of a perfect storm as the City’s expenditures on services began to increase (e.g. the San Fernando Regional Pool, Los Angeles Fire Department contract, and other projects added significant ongoing operations and maintenance costs) just before the onset of the “Great Recession” in 2007. Additionally, the State of California eliminated local redevelopment funding in 2012, which the City used to make infrastructure improvements and fund economic development programs. To remain solvent, the City reduced employee benefits, discontinued retiree medical benefits for new employees, implemented layoffs and furloughs, eliminated vacant positions, reduced department budgets, and renegotiated the contract with Los Angeles Fire Department. City employment was reduced from 160 in 2008 to 128 in 2017 (20% reduction). The number of sworn Police Officers was reduced from 37 in 2008 to 31 in 2017 (16% reduction). How can I be assured that local Sales Tax (Measure A) funds are being managed responsibly? Voters insisted there be accountability for the use of these revenues by including a requirement for an Annual Report to be presented at a public meeting. The Annual Report, provided each September, ensures prior year Measure A funds were collected, managed, and expended responsibly and consistent with City Council and community goals. The planned use of Measure A funds is clearly identified through the annual budget process and in the City Manager’s Budget Message. All current and prior Annual Reports and Budget documents are posted on the City’s website under the Financial Documents section of the Finance Department page, as well as this webpage. Measure A revenues are budgeted and recorded in a separate account in the City’s General Ledger. This allows the City staff to easily discern year-to-date receipts, update projections, and make budget adjustments, if necessary. Lastly, City staff conducts quarterly meetings with a consultant to review Sales and Transaction Tax receipts in detail. This provides staff with valuable information on the health of the local economy, various business sectors, and individual companies by reviewing their quarterly sales tax reports. It also gives staff an opportunity to make the consultant aware of new businesses opening in the City so staff can ensure compliance with Measure A. What steps has the City taken to address the deficit? In FY 2013-2014, the City Council began the development and implementation of a multi-year Deficit Elimination Plan. Put simply, the Deficit Elimination Plan aims to pay off debt, reduce ongoing expenditures and increase ongoing revenue. Revenues raised through Measure A have been critical to implementing the City’s Deficit Elimination Plan. 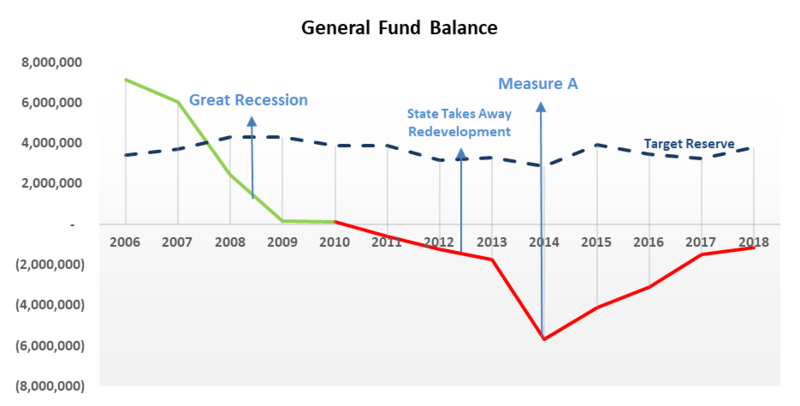 The City’s General Fund has been in a deficit fund balance position since Fiscal Year 2010-2011. To address the deficit, the City took a number of steps to stabilize ongoing finances, including reducing programs and services, reducing training and professional development opportunities for City staff, implementing layoffs and furloughs, and eliminating vacant positions. Many of these actions were short-term fixes that were necessary to remain solvent, but were not sustainable in the long-term. Renegotiated the Fire and Emergency Services contract with the Los Angeles Fire Department to reduce the City’s ongoing annual cost without reducing service (saved more than $500,000/year). Transferred operational and financial responsibility of the San Fernando Regional Pool to the County of Los Angeles through a lease of up to 55 years (saved more than $500,000/year). Reduced retiree health benefits for new employees to decrease the City’s retiree health (OPEB) liability (significant long-term savings). Sold surplus land and used the land sale proceeds to reduce the General Fund deficit (generated $1 million in proceeds). Developed a five-year General Fund projection to improve long-term decision making. Adopted a Development Agreement Ordinance to provide additional tools to increase economic development efforts and diversify the tax base. Re-established reserves for the Self-Insurance and Equipment Replacement Funds (more than $1 million in reserve to protect against large lawsuits). Updated user fees, development fees, cost allocation calculations to ensure an appropriate cost recovery for City services (more than $500,000/year in projected ongoing revenue). Updated the City’s long term financial planning policies, including budget, purchasing, debt management, grant management, investment, and reserve policies, with an emphasis on creating long term fiscal sustainability. 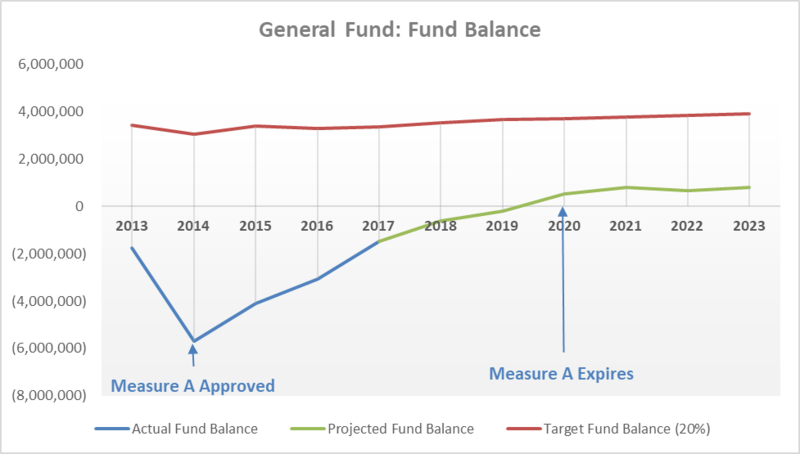 Despite the progress that has been made since 2013, the expiration of Measure A in 2020 will leave a significant gap in revenue just as the City is starting to build a solid financial base. Without a new revenue source, the City will be living “paycheck-to-paycheck” and be financially vulnerable to slight economic downturns, lawsuits, and long term pension liabilities. The City will also be unable to pave streets, repair recreation facilities, or replace police vehicles and equipment with any regularity. Are you interested in serving on the Measure "A" Community Advisory Committee? On November 19, 2018, the City Council approved the formation of a Measure “A” Community Advisory Committee to review the Annual Measure “A” Report and provide general recommended budget priorities for the use of Measure “A” funds during the annual budget process. The Committee will be made up of two residents, up to two business owners, up to two labor representatives, and one at-large member. The Committee is expected to meet at least twice per year. Anyone interested in serving the community on the Measure “A” Community Advisory Committee is encouraged to apply. Click Here to download an application.